California sea otter numbers are up, according to the latest population survey led by federal, state, and UC Santa Cruz scientists. The reasons: more pups and the addition of San Nicolas Island sea otters to the population count. Since the 1980s, U.S. Geological Survey scientists have calculated an averaged population index each year for the southern sea otter (Enhydra lutris nereis), a federally listed threatened species found in California. For the 2013 report, USGS lists the population index as 2,941 (data online). For southern sea otters to be considered for removal from threatened species listing, the population index would have to exceed 3,090 for three consecutive years, according to the threshold established under the Southern Sea Otter Recovery Plan by the U.S. Fish and Wildlife Service. "Population growth in central California has faltered recently, so the fact that we're seeing a slightly positive trend is a basis for cautious optimism," said Tim Tinker, a biologist with UC Santa Cruz and the USGS Western Ecological Research Center who supervises the annual survey. "Certainly, sea otters have made an impressive recovery in California since their rediscovery here in the 1930s. But as their numbers expand along California's coast, they are facing different 'growing pains' in different locales. Our research partnership is investigating the factors responsible for these local trends." Researchers from the USGS, UC Santa Cruz, California Department of Fish and Wildlife's Office of Spill Prevention and Response, Monterey Bay Aquarium, and other institutions collaborate annually to conduct the sea otter survey. The population index reported to USFWS is calculated as multiple-year averages of raw data from annual surveys to compensate for year-to-year variability in observation conditions and to give scientists a more reliable picture of sea otter abundance trends. "We counted a record number of pups this year, which led to the uptick in the 3-year average," said USGS biologist Brian Hatfield, coordinator of the annual survey. "A high pup count is always encouraging, although the number of adult otters counted along the mainland was almost identical to last year's count, so we'll have to wait and see if the positive trend continues." There is a second reason for the higher population index reported this year. In 2013, the equation for this population index was amended to add sea otters living at San Nicolas Island. One-hundred-and-forty sea otters were introduced to the island in the 1980s as part of a USFWS recovery experiment, but most of them returned to the mainland, died, or simply disappeared. USFWS completed an extensive review of the translocation program in December 2012, resulting in termination of the program. As a consequence, sea otters at San Nicolas Island are no longer considered to be an "experimental" population and will now be included as part of the California-wide population index for southern sea otter recovery. The population at the island is now at 59 individuals. USGS scientists also annually update a database of sea otter strandings, recording the number of dead, sick, or injured sea otters recovered along California's coast each year. In 2012, scientists from CDFW, USGS, Monterey Bay Aquarium, and other institutions came across a total of 368 stranded sea otters. This stranding number only accounts for sea otters that people find, and past research indicates that possibly less than 50 percent of sea otters that die in the wild end up on the beach. But efforts are made to examine each reported sea otter carcass, and a subset of fresh carcasses are sent to the CDFW Marine Wildlife Veterinary Care and Research Center, where scientists conduct necropsies to determine the primary causes of death and identify factors that may have contributed to the death of each animal. Data from both living and deceased sea otters continues to shed light on sea otter population ecology in different parts of the California coast. For example, a high proportion of sea otter carcasses recovered between Cayucos and Pismo Beach in recent years have white shark bite wounds, a potential explanation for the downward trend in sea otter numbers in that area. In Elkhorn Slough, a new study suggests that sea otter appetites for crabs can improve the health of seagrass beds. And at the southern end of their mainland range, researchers are observing sea otter feeding and movement behavior to understand their slow southward expansion. 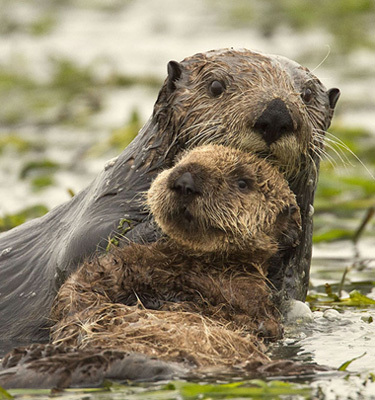 "Overall trends are important, but they can mask problems that may be affecting only a portion of the population," says Lilian Carswell, Southern Sea Otter Recovery Coordinator for USFWS. "These regional research projects help us understand the effects of local influences, whether human-caused or natural, and inform the overall southern sea otter recovery strategy." • The annual population index is calculated from visual surveys conducted along the California coastline by researchers, students and volunteers from USGS, CDFW's Office of Spill Prevention and Response, Monterey Bay Aquarium, UC Santa Cruz, USFWS, U.S. Bureau of Ocean Energy Management, and Santa Barbara Zoo. • Surveys are conducted via telescope observations from shore and via low-flying aircraft, typically from April through June. This year, the surveyed coastline spanned Point San Pedro in San Mateo County, south to Rincon Point near the Santa Barbara/Ventura County line, and also included San Nicolas Island. • The annual survey was interrupted in 2011, when weather conditions prevented the mainland survey's completion. • Sea otters were presumed extinct in California after the fur trade years, but were rediscovered in the 1930s by the public, when as few as 50 animals were documented persisting in nearshore areas off the coast of Big Sur. • Sea otters are considered a keystone species of the kelp ecosystem because they prey on herbivorous invertebrates that, if left unchecked, can decimate kelp beds and the fish habitat they provide. • Scientists also study sea otters as an indicator of nearshore ecosystem health, since sea otters feed and live near the coast and often are the first predators exposed to pollutants and pathogens washed down from coastlands, such as the microbial toxin microcystin. • The public can report sightings of stranded sea otters to institutions listed on this webpage.